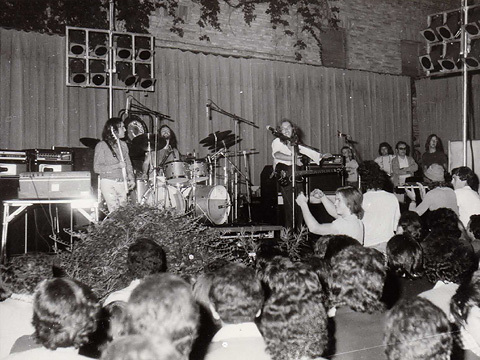 In 1973 at Malatestiana Court took place the first Fano Rock concert by a famous UK band, Tempest. A local band, Plenum, opened the concert and I had the luck to be able to attend the event. The great rock revolution had just begun! What affected the UK and American music scene during the first years of the 70s was really extraordinary. It was a true and strong music revolution. This explains why most of the ‘masterpieces released more than 40 years ago, are still study subjects for young musicians. 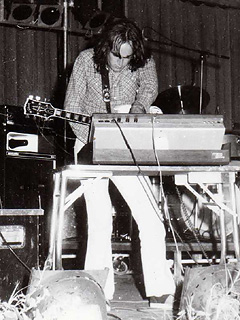 ‘Hard rock’ bands like Deep Purple, Led Zeppelin, Uriah Heep, Grand Funk, Vanilla Fudge; the ‘Progressive rock’ scene with Genesis, Yes, Gentle Giant, King Crimson, Jethro Tull; the ‘Rock/blues/jazz’ of Colosseum, Ten Years After, Free, Bad Company. Then we could mention Frank Zappa, Pink Floyd, Emerson Lake & Palmer, Santana, Weather Report, Soft Machine, but it would be a never ending list! Almost every week new recordings were released, providing something new, innovative, strong and exuberant on the contemporary music scene. 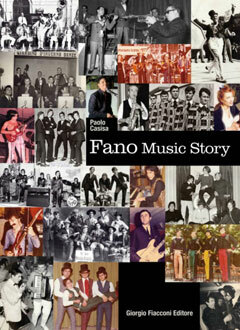 Also, in Italy, such music evolution was well represented by great bands like Premiata Forneria Marconi (PFM), Banco Del Mutuo Soccorso, New Trolls, Area and many, many more. 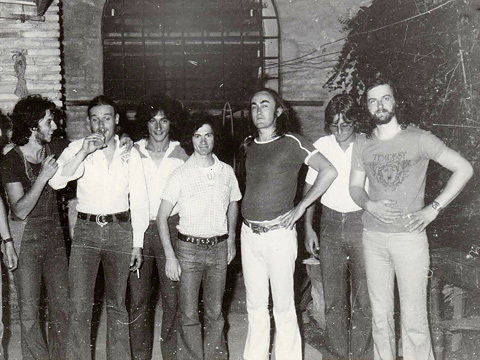 On the 29th of July of 1973, in Fano, a group of rock-loving kids were able to organize a concert with the new band of Jon Hiseman, the drummer with the UK Prog-rock blues band, Colosseum. His new band, Tempest, had just released their first recording and were touring Europe. 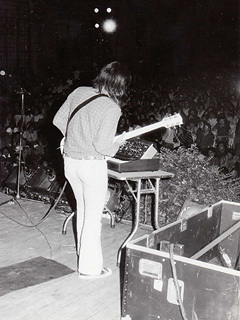 The Malatestiana court was crowded with guys willing to watch the exhibition of the best drummer in the world - that’s how Jon Hiseman was considered in those days!) 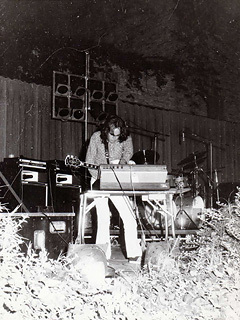 I was sitting there, 14 years old, just started beating the drum and developing my great passion for music itself. It was my first rock concert ever and I was really excited. In my kids eyes, Tempest appeared as three aliens from another planet here to provide rock lessons to everybody! The concert started quickly in a great way, with Ollie Halsall screaming his electric guitar with incredible phrasing, something never heard before. He was certainly a true innovator of the instrument. remember well that, at some point Ollie began a solo during which he did something strange which I had never seen before - a kind of spider's approach using two hands! 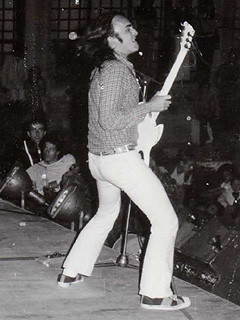 He was the true inventor of the guitar technique called ‘tapping’ that made Eddie Van Halen world-famous from 1978 onwards. 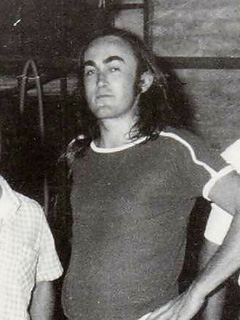 Listen carefully to the first two Patto recordings by one of Halsall’s first bands, Patto (Patto, 1970 and Hold Your Fire, 1971) and you will agree that the technique of striking the neck of the guitar with both hands was invented by Ollie, eight years before Van Halen! Probably, no one caught the point of what Ollie was playing that night and it was the same for me. I couldn’t understand anything about his prodigious technique, but the memory of the spider's approach with two hands remained fixed in my mind! The musical impact of that concert was really amazing, the rock soul itself was spread out through piercing guitar and synth solos by Halsall, gritty vocals by bassist Mark Clarke, fine arrangements, and a percussive grinding drum machine rolling in the background! John Hiseman, on that warm July night, played a great drum solo. In 25 long minutes he showed all of his drum technique, feeling and passion. At one point, he took three drumsticks and started a juggling performance by throwing a stick in the air, while the other two continued to roll without any apparent effort. A wonderful show! The concert ended with long and interminable applause by the crowd; everybody realising that they had just assisted at a unique and unrepeatable event.